Micro-Vu Non-contact Visual Inspection Devices: Our Micro-Vu measurement systems are J Royal’s main inspection tools. They are highly sophisticated, computerized machines that can automatically measure parts against industry standards or the customer’s prints or drawings. Micro-Vu has an advantage over an optical comparator in that it can take measurements in the Z-axis (vertically). This accommodates dimensional measurements that normally would need to be taken on sectioned samples. Also, given the 3D nature of the Micro-Vu measurement system, we can measure distance, angle, diameter, radius, circularity, flatness, concentricity, parallelism, sphericity, true position, plus many more GD&T features. Density: We measure the specific gravity of incoming products through the Archimedes process. This enables us to quickly verify the compound type because the most common elastomers have a wide enough density range to allow identification through the specific gravity method. Shore A & M durometers: One of the most important physical properties of rubber materials is hardness. 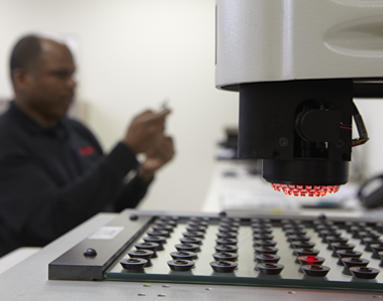 J Royal is equipped to measure incoming product on either Shore scale which helps us ensure that incoming parts meet customer hardness specifications. Typically, J Royal measures incoming shipments with the Shore A probe, though smaller parts often require durometer readings with the Shore M probe. Note that J Royal maintains complete calibration records with all our inspection equipment. Also, we demand that every QC equipment calibration service provider is ISO/IEC 17025 certified.